The no mans land of post Oscar season film releases continues to roll along, and it appears that I can only watch films starring Kevin Hart this month. Following the utterly mediocre experience that was Ride Along, the pint sized actor comedian is back on my big screen in About Last Night, a remake of the 1986 film of the same name that was based on David Mamet’s 1974 play Sexual Perversity In Chicago. The main change for this twenty first century retelling is the filmmaker’s choice to assign all leading roles to black actors, a noticeable departure from the whitewash of the original starring the likes of Rob Lowe, Demi Moore, Elizabeth Perkins and James Belushi. My main interest in the film was based around the question of whether it would be able to rise above its racial focus and present itself as a mainstream, accessible film for all, and though About Last Night certainly boasts a predominantly black cast, I feel that it is not in the same bracket as certain works by filmmakers like Tyler Perry that cater to and feel specifically produced for an African American audience. The central themes of the picture are love, dating and separation, portraying the romantic lives of two couples living in modern day Los Angeles and all of the tensions and complications that arise in both committed and casual relationships. Almost immediately, for me, at least, the race of the characters becomes completely irrelevant when the themes with which they are dealing are so universal. Above all of this though, ultimately, is the fact that the film in general is utterly forgettable and rather weak on all fronts. 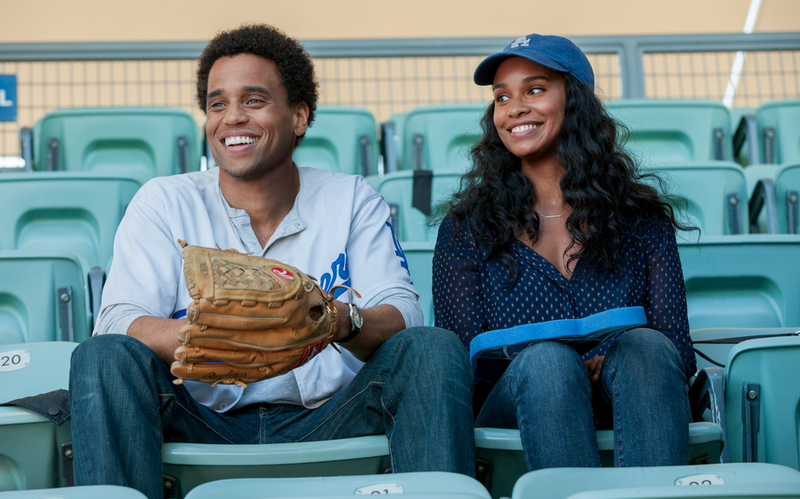 The film plays along the lines of When Harry Met Sally, putting protagonists Danny (Michael Ealy) and Debbie’s (Joy Bryant) relationship under the microscope, documenting the sacrifices and changes one has to make in order to find true contentment with a loved one. The problem with this is that we have seen it done a million times better, a million times before, in a million different movies. Every aspect of the film’s central narrative is completely predictable and, to be brutally honest, dull as hell. The audience are treated to the usual arguments involving ex-spouses, the decision to get a dog and the need for one’s personal space, and the unoriginal progression of the plot results in a complete lack of investment from the audience, it is hard to care about a story that you have been told so many times before. The one small slither of satisfaction comes in the story of and interaction between the supporting characters and second couple Bernie (Kevin Hart) and Joan (Regina Hall), whose outlandish dialogue and actions provide some much needed comic relief in opposition to the mostly sombre and more serious relationship exploration between Danny and Debbie. Though my lasting opinion of About Last Night is one of ultimate disinterest and unoriginality, the cause of my disappointment lies more with the cliched central romantic narrative than with the films main cast. Michael Ealy as Danny has the Hollywood looks for a leading role in any picture and is as engaging as he can be in what is a rather flat leading role. I am fairly familiar with Joy Bryant thanks to her performances on NBC’s family drama Parenthood, a show of which I am a big fan, and though she is laboured with the ‘straightest’ role of the four central characters, her dramatic acting is solid and believable and the chemistry she strikes with Ealy is strong enough to guide the audience through their rather pedestrian love affair. Whilst we may not be particularly invested in the outcome of their relationship, it cannot be described as chore to watch and that is thanks to the actors depicting it. Where the film really comes to life, though, is in the larger than life performances of Regina Hall and, especially, Kevin Hart. Hall as Debbie’s extroverted best friend Joan is lively and mostly hilarious in her handful of key scenes, her inclination to speak the truth causing me to laugh out loud on more than a few occasions. Kevin Hart as Bernie is just as vibrant as one would expect him to be, a much better and funnier performance than was given in Ride Along simply for the fact that he has better actors and slightly better material with which to work. Whereas his over the top, jack in the box energy became tiresome when paired with the solemn, hard man presence of Ice Cube in his previous picture, Hart’s partnership with the equally vivacious Regina Hall proves to be a total highlight of the film and undoubtedly produces the piece’s longest and loudest laughs. 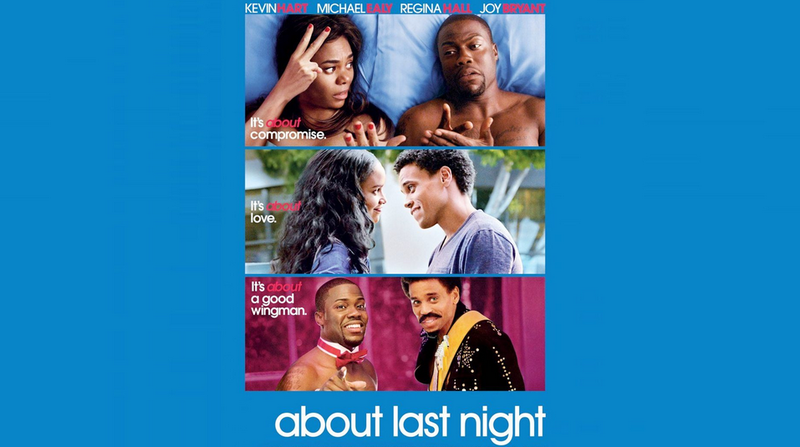 Overall, About Last Night is a romantic comedy that serves as an easy but ultimately forgettable viewing experience. Though the film’s cast is likeable and at certain points enjoyable, the unoriginal nature of the narrative means that the film is certainly not worth cancelling any pre-existing plans for. The company is inoffensive and, more importantly, generally funny, and this saves the picture from being a complete waste of time, but it certainly won’t be a film that you recommend to your friends or make the conscious decision to see again. Man, I really wanna see Ealy break out. He is an underrated actor. Best thing about Almost Human. Nice review, this film looks middling, but one I may check out if it was on TV. Sounds like one to watch on Netflix.